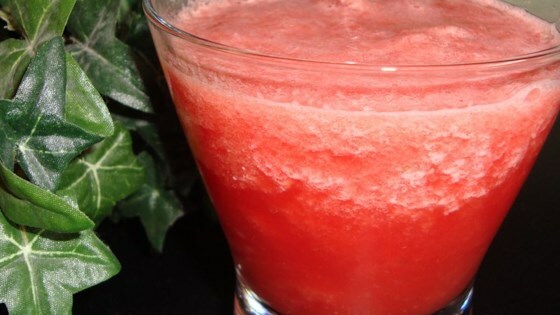 "A Thailand watermelon slushie that is sweetened with honey. You may use sugar if you wish though." Place the ice cubes into a blender. Cover, and pulse until crushed. Add the watermelon and blend for about 1 minute, until slushy. Add the honey, and blend for about 10 seconds. I like this a lot! Although I had to sweeten it a lot more for my tastes. I used about tablespoon of honey and two to three tablespoons sugar. Well done tho. Instead of using ice cubes, I blended in frozen strawberries with the watermelon. Didn't add any honey or sweetener, but did add a small amount of 7Up. Delish! Good idea for turning extra watermelon into a cool summer's drink. I added ginger ale and 1 tsp of sugar to give it a little kick. Great summer drink! I turned it into an adult drink by adding a bit of tequila. Very refreshing!